So yeah, I have a groundhog living in my basement. He dug himself a little tunnel in and set up his bachelor pad in the middle of my basement. I was pretty sure that he was living there, but had not fully investigated the situation until yesterday. I had seen him in the backyard several times and had noticed a hole at the corner of my house that the dogs sniff around a lot. I gathered up some courage yesterday and went down to the basement to check things out. I did not see him (probably a good thing cause I think that would have totally freaked me out! ), but saw plenty of evidence of him. I am not interested in being a landlord or adding a new member to the family, so I need to find a way to evict him. In my quest to rid myself of this pesky house guest, I have learned quite a bit about groundhogs. They are herbivores, but will eat some bugs. When cornered, they can be rather feisty. Evidently in this area to trap them, you have to have a permit. Animal Control has provided me with the name of three men who have said permits. The groundhog in my basement appears to be packing on the pounds for the winter. He is quite chubby. Groundhogs are hard to get rid off. It is illegal to fire a gun in the city limits and to have a silencer for said gun. Several of my friends own dogs that are good at hunting and killing various animals. Ground hogs hibernate (hence my hurry to get rid of it as I do not want a guest for the winter). 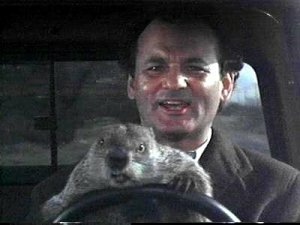 The gestation period for groundhogs is only 32 days. There is a ground hog living in Ontario named Wiarton Willie and he is 22 years old. Groundhogs can climb over a short fence. And that's what I've learned so far. I hope to be serving an eviction notice soon. Maybe I'll get to meet someone like Billy the Exterminator during this fun little adventure. Stay tuned for updates. I love being a PA. I have encouraged several people to pursue this field. I enjoy my job most days. Sometimes though, when it's been a particularly bad day or I'm feeling a little restless, I think about looking for a new career. Because I'm a realist, my "dream jobs" don't include things like super star, world class athlete, actress or any of the so called glamorous jobs. Those things aren't really me and I don't think I'd be very happy with them. I like to work, but some days the responsibility and decision making gets to me and I dream of days where no one looks to me for answers and I can just show up do my job, and go home. So I've come up with a list of alternative occupations that I could see myself doing. A couple are still health care related, but sometimes it's hard to break away from what you love. 1. Scrub Tech During my annual GYN surgery trip to Mexico last week, I was reminded just how much I love being in the OR. Scrub techs get the chance to be in the OR and be involved in the surgery without the pressure of actually doing the operation. 2. Nanny I love kids, especially the little ones. I think being a nanny would be great. I recently saw an ad for a position and have to admit I considered applying. I know there are some bad positions out there, but I feel like those are the super elite families with more money than sense. Being a nanny over seas would be my really dream job. 3. Flight Attendant I believe that's the PC term these days. It's pretty clear I love to travel and see different places. I would of course want to fly the cross country and international routes. I know I'd have to deal with some jerks along the way, but think of all the cheap trips I could take. 4. Cupcake Shop Owner/Baker If I had lots of money, this is seriously the one I would most likely do. I love to bake, and anyone who knows me, knows that cupcakes are my thing. I think it would so much fun to have my own shop and get to bake and design cupcakes all day long. Of course the stress of running my own business that whole turning a profit in order to pay the bills thing might not be so great. 5. Paramedic I really considered this when I was in high school. I think it would be fun to work on the ambulance or even better the helicopter. To truly get to make decisions that can save a person's life and do life saving procedures. I know there's a lot of taxi driving involved with that too, but for the real emergencies it would be pretty great. 6. Product Reviewer I think it would be fun to test out new inventions, try new foods, play new games and give my feedback on them. I think it could also be good for a few laughs. I realize that some of you are thinking that a lot of these jobs aren't much different from my life now or that they don't sound very interesting, but it's my list. And while I don't plan a career change in the near future, it's always good to have a backup plan.